This kit includes Tanis Gray's Cozy Knits book and three skeins of Cascade's Pacific yarn in lavendar, Italian plum, and Concord grape. Knitters love purple! Grab your Cozy Knits Pacific Purple Kit today! 3 skeins of Cascade's Pacific yarn in modern shades of purple! We make it easy for you. With this kit you can tackle some of the cozy, cute projects featured in the popular new book. 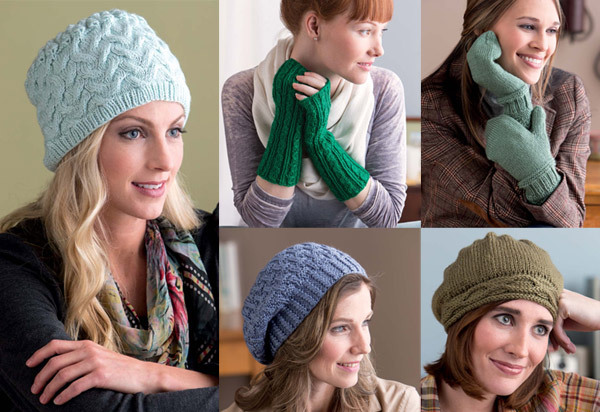 Cozy Knits has 27 projects that use Cascade's Pacific yarn, 11 of which only require one skein. 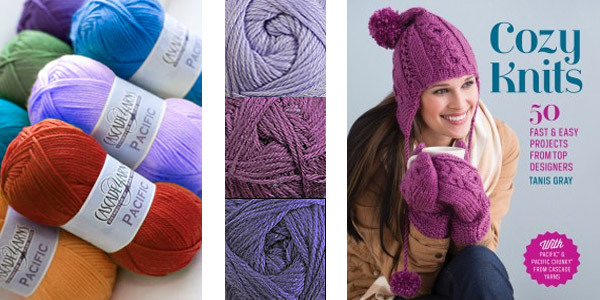 From cute hats with cables and ribbing to feminine lace cowls and classic mittens with a twist, you'll find an abundance of ways to use your new Pacific yarn! Looking for stylish, cozy knitted accessories that can be knit in a weekend. Looking for projects using modern, durable yarns that can withstand the washing machine. Are a novice to intermediate knitter that wants to tackle fun, easy knitting patterns. Order this affordable Cozy Knits Kit for any knitter on your gift list! The Cozy Knits Pacific Purple Kit includes one skein of #26 Lavender, one skein of #44 Italian Plum, and one skein of #45 Concord Grape. Pacific yarn is a blend of 40% superwash merino wool and 60% acrylic yarn. Each skein contains 213 yards of durable, soft yarn. *Colors may vary slightly from what you see here. Hurry! We have limited quantities of this Kit! Order yours today and start knitting Cozy Knits in Pacific Purple!